How Healthy Is Plain Yogurt? Plain yogurt can help you meet your requirements for essential nutrients. Many brands of yogurt have probiotics, or healthy bacteria that may fight infections and treat diarrhea. MayoClinic.com recommends choosing a yogurt whose label claims it has live bacterial cultures such as Lactobacillus. 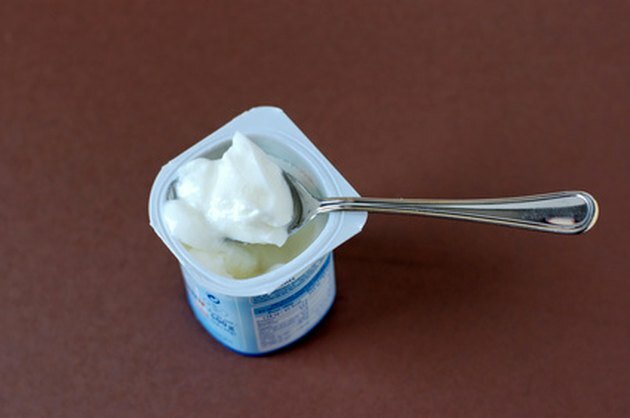 Plain yogurt has about 130 calories per cup. It can be fat-free, but yogurt from whole milk has about 7 g total fat, with nearly 5 g from unhealthy saturated fat. Plain yogurt has about 8 to 13 g high-quality protein, which means it has all of the amino acids that your body needs for good health. A 1-cup serving of plain yogurt provides about 250 to 450 mg calcium, depending on the exact formulation of the yogurt. The 2005 Dietary Guidelines from the U.S. Department of Health and Human Services states that many adults and children may not get enough calcium from their diets, and this lack can increase the risk for osteoporosis and bone fractures. Your body needs vitamin D to properly absorb and use calcium, and some plain yogurt is fortified with vitamin D.
Obesity can increase your risk for chronic diseases such as heart disease and type 2 diabetes, and plain yogurt can help you control your weight. Low-fat or fat-free yogurt is low in energy density, which means it does not have many calories in a serving. The protein in yogurt can help you control your weight since protein slows down digestion and makes you less hungry. According to the 2005 Dietary Guidelines, adults on a 2,000-calorie diet should eat about three servings of low-fat or fat-free dairy products each day. A serving is 1 cup of milk, 1.5 oz. of cheese or 1 cup of yogurt. Plain yogurt is healthier and lower in calories than fruit-flavored yogurt with added sugars, but a sweetened yogurt may be an easier way to increase your dairy intake if you do not like milk or plain yogurt. MayoClinic.com: Probiotics: Important for a Healthy Diet? Is Fat-Free Yogurt Good for a Late Night Snack?